Muse released their debut album, Showbiz, in 1999, showcasing Bellamy's falsetto and a melancholic alternative rock style. 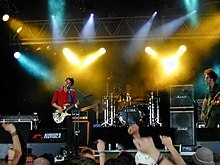 Their second album, Origin of Symmetry (2001), expanded their sound, incorporating wider instrumentation and romantic classical influences, and earned them a reputation for energetic live performances. 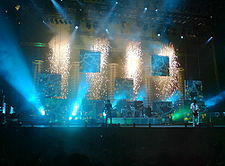 Absolution (2003) saw further classical influence, with orchestra on tracks such as "Butterflies and Hurricanes", and became the first of five consecutive UK number-one albums. Black Holes and Revelations (2006) incorporated electronic and pop elements, influenced by 1980s groups such as Depeche Mode, displayed in singles such as "Supermassive Black Hole". The album brought Muse wider international success. 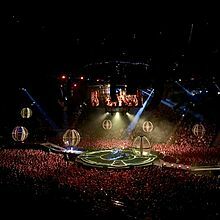 The Resistance (2009) and The 2nd Law (2012) explored themes of government oppression and civil uprising and cemented Muse as one of the world's major stadium acts. Their seventh album, Drones (2015), was a concept album about drone warfare and returned to a harder rock sound. The members of Muse played in separate school bands during their stay at Teignmouth Community College in the early 1990s. Guitarist Matt Bellamy successfully auditioned for drummer Dominic Howard's band, Carnage Mayhem, becoming its singer and songwriter. They renamed the band Gothic Plague. They asked Chris Wolstenholme – at that time the drummer for Fixed Penalty – to join as bassist; he agreed and took up bass lessons. The band was renamed Rocket Baby Dolls and adopted a goth-glam image. In 1994, Rocket Baby Dolls won a local battle of the bands, smashing their equipment in the process. Bellamy said: "It was supposed to be a protest, a statement, so, when we actually won, it was a real shock, a massive shock. After that, we started taking ourselves seriously." The band quit their jobs, changed their name to Muse, and moved away from Teignmouth. The name "Muse" was supposedly inspired by Matthew Bellamy's art teacher Samuel Theoun. The band liked that it was short and thought that it looked good on a poster. According to journalist Mark Beaumont, the band wanted the name to reflect "the sense Matt had that he had somehow 'summoned up' this band, the way mediums could summon up inspirational spirits at times of emotional need." After a few years building a fanbase, Muse played their first gigs in London and Manchester supporting Skunk Anansie on tour. They had a significant meeting with Dennis Smith, the owner of Sawmills Studio, situated in a converted water mill in Cornwall. He had seen the three boys grow up as he knew their parents, and had a production company with their future manager Safta Jaffery, with whom he had recently started the record label Taste Media. The meeting led to their first serious recordings and the release of the Muse EP on 11 May 1998 on Sawmills' in-house Dangerous label, produced by Paul Reeve. Their second EP, the Muscle Museum EP, also produced by Reeve, was released on 11 January 1999. It reached number 3 in the indie singles chart and attracted the attention of British radio broadcaster Steve Lamacq and the weekly British music publication NME. Later in 1999, Muse performed on the Emerging Artist's stage at Woodstock 1999 and signed with Smith and Jaffery. During the production of their second album, Origin of Symmetry (2001), Muse experimented with instrumentation such as a church organ, Mellotron, animal bones, and an expanded drum kit. There was more of Bellamy's falsetto, arpeggiated guitar, and piano playing. Bellamy cites guitar influences such as Jimi Hendrix and Tom Morello (of Rage Against the Machine), the latter evident in the more riff-based songs in Origin of Symmetry and in Bellamy's use of guitar pitch-shifting effects. The album features a cover of Anthony Newley and Leslie Bricusse's "Feeling Good", voted in various polls one of the greatest cover versions of all time. It was released as a double A-side single, "Hyper Music/Feeling Good". In 2002, Muse threatened Celine Dion with legal action when she planned to name her Las Vegas show "Muse", despite the band owning the worldwide performing rights to the name. Dion offered Muse $50,000 for the rights, but they turned it down and Dion backed down. Bellamy said "We don't want to turn up there with people thinking we're Celine Dion's backing band." Muse's third album, Absolution, produced by Rich Costey, Paul Reeve and John Cornfield was released in September 2003. It debuted at number one in the UK and produced Muse's first top-ten hit, "Time Is Running Out", and three top-twenty hits: "Hysteria", "Sing for Absolution" and "Butterflies and Hurricanes". Absolution was eventually certified gold in the US. Muse undertook a year-long international tour in support of the album, visiting Australia, New Zealand, the United States, Canada, and France. On the 2004 US leg of the tour, Bellamy injured himself onstage during the opening show in Atlanta; the tour resumed after Bellamy received stitches. Muse won two MTV Europe awards, including "Best Alternative Act", and a Q Award for "Best Live Act", and received an award for "Best British Live Act" at the Brit Awards. In July 2005, they participated in the Live 8 concert in Paris. In 2003, the band successfully sued Nestlé for using their cover "Feeling Good" for a Nescafé advertisement without permission and donated the money won from the lawsuit to Oxfam. An unofficial DVD biography, Manic Depression, was released in April 2005. Muse released another live DVD on 12 December 2005, Absolution Tour, containing edited and remastered highlights from their Glastonbury performance unseen footage from their performances at London Earls Court, Wembley Arena, and the Wiltern Theatre in Los Angeles. Muse spent November and much of December 2006 touring Europe with British band Noisettes as the supporting act. The tour continued in Australia, New Zealand and Southeast Asia in early 2007 before returning to England for the summer. At the 2007 Brit Awards in February, Muse received their second award for Best British Live Act. They performed two gigs at the newly rebuilt Wembley Stadium on 16 and 17 June 2007, and became the first band to sell out the new Wembley. Both concerts were recorded for a DVD/CD, HAARP, released in early 2008. It was named the 40th greatest live album of all time by NME. The tour continued across Europe in July 2007 before returning to the US in August, where Muse played to a sold-out crowd at Madison Square Garden, New York. They headlined the second night of the Austin City Limits Music Festival on 15 September 2007, and performed at the October 2007 Vegoose in Las Vegas with bands including Rage Against the Machine, Daft Punk and Queens of the Stone Age. Muse continued touring in Eastern Europe, Russia and Scandinavia before going to Australia and New Zealand. They played their final show of the Black Holes and Revelations tour as the headliner of the KROQ Almost Acoustic Christmas. In March 2008, Muse played concerts in Dubai, Johannesburg and Cape Town. On 12 April, they played a one-off concert at the Royal Albert Hall, London in aid of the Teenage Cancer Trust. The Resistance Tour started with A Seaside Rendezvous in Muse's hometown of Teignmouth, Devon, in September 2009, and included headlining Coachella Festival in April 2010 and two gigs at Wembley Stadium in September. The band also supported the U2 360° Tour. In January 2010, Muse headlined the Big Day Out festivals in Australia and New Zealand, starting with Auckland and ending with Perth. They headlined the American Coachella festival on Saturday 17 April and headlined the Glastonbury Festival 2010 along with Gorillaz and Stevie Wonder, as well as the Oxegen festival in 2010 alongside Arcade Fire and Eminem. The group were also headline on the 2010 Hovefestivalen, as well as T in the Park 2010 and among other festivals, including the Austin City Limits Music Festival. On 20 April 2010, the band announced fourteen dates for a North American tour, which were to be held between September and November 2010. They added four dates to their forthcoming North American tour on 28 April 2010. On 7 May 2010 it was announced that Muse would provide the lead single for the film The Twilight Saga: Eclipse. The soundtrack's lead single "Neutron Star Collision (Love Is Forever)" was released on 17 May 2010. In June, Muse headlined Glastonbury Festival for the second time, and were joined by U2 guitarist The Edge to play "Where the Streets Have No Name", after U2 pulled out of their headlining slot due to singer Bono's back injury. For their live performances, Muse received the O2 Silver Clef Award in London on 2 July 2010. The award was presented by Roger Taylor and Brian May of Queen. Taylor described the trio as "probably the greatest live act in the world today". On 12 September 2010, Muse won an MTV Video Music Award in the category of Best Special Effects, for the "Uprising" promo. On 21 November, Muse took home an American Music Award for Favorite Artist in the Alternative Rock Music Category. On 2 December, Muse were nominated for three awards for the 53rd Grammy Awards on 13 February 2011, for which they won the Grammy Award for Best Rock Album for The Resistance. In an April 2012 interview, Bellamy said Muse's next album would include influences from acts such as French house duo Justice and UK electronic rock group Does It Offend You, Yeah?. On 6 June 2012, Muse released a trailer for their next album, The 2nd Law, with a countdown on the band's website. The trailer, which included dubstep elements, was met with mixed reactions. The trailer begins with classical sounding music in the background, but progresses into full on dubstep which some fans were not thrilled about, openly expressing their doubts toward the quality of the album; on the other hand, some fans were excited to hear yet another progression in Muse's sound. On 7 June, Muse announced a European Arena tour, the first leg of The 2nd Law Tour. The leg included dates in France, Spain and the UK. The first single from the album, "Survival", was the official song of the London 2012 Summer Olympics, and Muse performed it at the Olympics closing ceremony. The single premiered on BBC Radio 1's Zane Lowe show on 27 June. Muse revealed The 2nd Law tracklist on 13 July 2012. The second single, "Madness", was released on 20 August 2012, with a music video released on 5 September. Muse played at the Roundhouse on 30 September as part of the iTunes Festival. The 2nd Law was released worldwide on 1 October, and on 2 October 2012 in the US; it reached number one in the UK Albums Chart, and number two on the US Billboard 200. The song "Madness" earned a nomination in the Best Rock Song category and the album itself was nominated for the Best Rock Album at the 55th Grammy Awards, 2013. The band performed the album's opening song, "Supremacy", with an orchestra at the 2013 Brit Awards on 20 February 2013. Muse began writing their seventh album soon after the Rome concert. The band felt that the electronic side of their music was becoming too dominant, and wanted to return to a simpler rock sound. After self-producing their previous two albums, the band decided to work with producer Robert John "Mutt" Lange so they could focus on performance and spend less time mixing and reviewing takes. Recording took place in the Vancouver Warehouse Studio from October 2014 to April 2015. In February 2017, Muse announced a North America tour with Thirty Seconds to Mars and PVRIS to take place later in the year. Howard confirmed on his Instagram the band were back in the studio. On 5 April, Muse posted studio footage on social media and announced a new song to be released soon. On 8 and 9 May, the band teased the new single in behind-the-scenes clips of the filming of a music video. On May 11, Muse announced that their new single, "Dig Down", would be released on 18 May 2017. Muse mix sounds from genres such as electronic music, progressive metal and art rock, and forms such as classical music, rock opera and many others. The band's style has been also described as "space rock." In 2002, Bellamy described Muse as a "trashy three-piece". In 2005, Pitchfork described Muse's music as "firmly ol' skool at heart: proggy hard rock that forgoes any pretensions to restraint ... their songs use full-stacked guitars and thunderous drums to evoke God's footsteps." AllMusic described their sound as a "fusion of progressive rock, glam, electronica, and Radiohead-influenced experimentation." On the band's association with progressive rock, Howard said: "I associate it [progressive rock] with 10-minute guitar solos, but I guess we kind of come into the category. A lot of bands are quite ambitious with their music, mixing lots of different styles – and when I see that I think it's great. I've noticed that kind of thing becoming a bit more mainstream." For their second album, Origin of Symmetry (2001), Muse wanted to craft a more aggressive sound. In 2000, Wolstenholme said: "Looking back, there isn't much difference sonically between the mellow stuff and the heavier tracks [on Showbiz]. The heavy stuff really could have been a lot heavier and that's what we want to do with [Origin of Symmetry]." Their third album, Absolution (2003), features prominent string arrangements and began to draw influences from artists such as Queen. Their fourth album, Black Holes and Revelations (2006) was influenced by artists like Depeche Mode and Lightning Bolt, as well as Asian and European music such as Naples music; additionally, the band listened to radio stations from the Middle East during the album's recording sessions. Queen guitarist Brian May has praised Muse's work, calling the band "extraordinary musicians", who "let their madness show through, always a good thing in an artist." Muse's sixth album, The 2nd Law (2012) has a broader range of influences, ranging from funk and film scores to electronica and dubstep. The 2nd Law is influenced by rock acts such as Queen and Led Zeppelin (on "Supremacy") as well as dubstep producer Skrillex and Nero (on "The 2nd Law: Unsustainable" and "Follow Me", with the latter being co-produced by Nero), Michael Jackson, Stevie Wonder (on "Panic Station" which features musicians who performed on Stevie Wonder's "Superstition") and Hans Zimmer. The album features two songs with written and sung by bassist Chris Wolstenholme, who wrote about his battle with alcoholism. Many Muse songs are recognizable by lead vocalist Matt Bellamy's use of vibrato, falsetto, and melismatic phrasing, influenced by Jeff Buckley. As a pianist, Bellamy often uses arpeggios. Bellamy's compositions often suggest or quote late classical and romantic era composers such as Sergei Rachmaninov (in "Space Dementia" and "Butterflies and Hurricanes"), Camille Saint-Saëns (in "I Belong to You (Mon Coeur S'ouvre À Ta Voix)") and Frédéric Chopin (in "United States of Eurasia"). As a guitarist, Bellamy often uses the arpeggiator and pitch-shift effects to create a more "electronic" sound, citing Jimi Hendrix and Tom Morello as influences. His guitar playing is also influenced by a more classical harmonic aesthetic, particularly the style of Latin and Spanish guitar music, as Bellamy cites: "I learnt some Spanish guitar music that opened up a world of different harmonies and making music and a different sort of passion; very heavy music but it hasn't got a distortion pedal." The bassline, performed by Wolstenholme, is the central motif of many Muse songs, usually fuzz bass, an overdriven, distorted tone. Both Bellamy and Wolstenholme use touch-screen controllers, often built into their instruments; this touch screen can control a variety of synthesizers and digital effects pedals but is most often used to control a Korg Kaoss pad or Digitech Whammy pedal. Most earlier Muse songs lyrically dealt with introspective themes, including relationships, social alienation, and difficulties they had encountered while trying to establish themselves in their hometown. However, with the band's progress, their song concepts have become more ambitious, addressing issues such as the fear of the evolution of technology in their Origin of Symmetry (2001) album. They deal mainly with the apocalypse in Absolution (2003) and with catastrophic war in Black Holes and Revelations (2006). The Resistance (2009) focused on themes of government oppression, uprising, love, and panspermia. The album itself was mainly inspired by Nineteen Eighty-Four by George Orwell. Their sixth studio album, The 2nd Law (2012) relates to economics, thermodynamics, and apocalyptic themes. Their latest album, Drones (2015) is a concept album that uses autonomous killing drones as a metaphor for brainwashing and loss of empathy. The 12th Planet by Zecharia Sitchin. ^ a b "muse: biography". microcuts.net. Retrieved 4 August 2007. ^ a b "Muse". Wiki.Fuse.tv. Retrieved 3 September 2010. ^ "Muse biography". ticketmaster. ie. Retrieved 2 May 2008. ^ "NME article". NME. 2003. Retrieved 19 January 2008. ^ "TG's Best Covers EVER!". Total Guitar. 2008-06-23. Retrieved 2008-10-16. ^ a b SPIN Sep 2009. Books.google.com. Retrieved 28 September 2014. ^ CMJ New Music Monthly 2003. Books.google.com. Retrieved 28 September 2014. ^ "Search Results". Gold and Platinum. RIAA. Retrieved 27 January 2008. ^ "Artist of the week". TV artist of the week. MTV. June 2004. Archived from the original on 15 December 2007. ^ "LIVE 8 Concerts – Live 8". Live8live.com. 2 July 2005. Retrieved 3 September 2010. ^ Amazon, Amazon. "Manic depression". Amazon.com. Retrieved 2 April 2008. ^ Raper, Dan (19 July 2006). "Black Holes & Revelations". Pop Matters. Retrieved 24 January 2008. ^ Kent, David (1993) (doc). Australian Chart Book 1970–1992. Australian Chart Book, St Ives, N.S.W. ^ "Muse – Black Holes & Revelation". Music Charts. αCharts. Retrieved 27 January 2008. ^ "Current Tour Dates". Muse Syndrome. 5 February 2006. Archived from the original on 22 August 2006. ^ "Mercury Music Prize 2006... and the winner is... -> Rawkstar.net music news". Rawkstar.net. 6 September 2006. Retrieved 3 September 2010. ^ "IFPI Platinum Europe Awards – 2009". News. IFPI. 2006. Retrieved 27 January 2008. ^ "MOTP – Wembley Souvenir Download". Microcuts.net. 8 June 2007. Retrieved 27 January 2007. ^ "2007 – British live act: Muse". Brits.co.uk. Retrieved 28 September 2014. 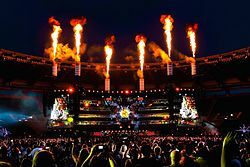 ^ "Muse wow Wembley". BBC. 9 November 2016. ^ "H. A. A. R. P – CD/DVD – Out 17 March!". Muse.mu. 1 February 2008. Retrieved 3 February 2008. ^ "Muse to Release Live CD/DVD on 1 April". press release. Warner Bros. Records. 19 February 2008. Retrieved 23 February 2008. ^ "The 50 greatest live albums of all time". NME. United Kingdom. 40 – Muse – 'Haarp'. 9 March 2011. ISSN 0028-6362. Retrieved 5 February 2012. ^ "Tour Dates". Muse.mu. Retrieved 23 February 2008. ^ "Rock in Rio Lisboa: Muse ao vivo [texto+fotos]". Blitz Portugal. Retrieved 6 June 2008. ^ Lynskey, Dorian. "Muse: 'We like pushing it as far as we can'". the Guardian. Retrieved 2015-10-08. ^ "Muse – The Resistance Album Review". ^ Leah Collins (1 March 2010). "Muse No Longer on Eclipse Soundtrack; Now What Will We Play at the Vampire Baseball Game?". Dose.ca. Retrieved 3 September 2010. ^ Jeremy King and David Quainton (2 February 2010). "Michael Eavis reveals Muse and Stevie Wonder to play Glastonbury at Event Production Show". Eventmagazine.co.uk. Retrieved 3 September 2010. ^ "Eminem and Muse join Kasabian at T in the Park". BBC News. 23 February 2010. Retrieved 3 September 2010. ^ Murray, Robin (28 April 2010). "Muse expand North American tour". Clash Music. Retrieved 28 April 2010. ^  Archived 19 July 2012 at the Wayback Machine. ^ "Muse reveal dubstep-tinged trailer for new album 'The 2nd Law' - NME". NME. 2012-06-06. Retrieved 2016-10-27. ^ "New Muse song Survival is the main Olympics song, to premiere today". Rekwired. 27 June 2012. Retrieved 27 June 2012. ^ a b c "Chris Wolstenholme and Muse Return to Their Hard Rock Roots". www.bassplayer.com. Retrieved 2016-04-08. ^ "Muse: Stream New Single 'Mercy' Taken From Seventh Studio Album 'Drones'". Inveterate. 18 May 2015. Retrieved 18 May 2015. ^ Caulfield, Keith (2015-06-17). "Muse Earns Its First No. 1 Album on Billboard 200 Chart". Billboard. Retrieved 2015-06-17. ^ "Archived copy". Archived from the original on 7 September 2016. Retrieved 2016-06-25. ^ "MUSE ARE YOUR FIRST #RANDL17 HEADLINERS!". Reading festival. ^ Britton, Luke Morgan (5 April 2017). "Watch Muse work on music and say new song is 'coming soon'". NME. Retrieved 9 May 2017. ^ Trendell, Andrew (10 May 2017). "Muse tease new single and music video". NME. Retrieved 10 May 2017. 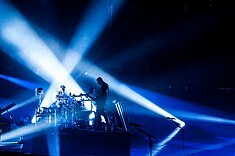 ^ "Muse : Paris: Bercy: Tuesday November 18". NME. 12 September 2015. Retrieved 30 March 2015. ^ "Muse Reveals Skrillex As Major Influence on New Album 'The 2nd Law'". MTV. Retrieved 17 September 2012. ^  Archived 18 November 2015 at the Wayback Machine. ^ "muse : archives | microcuts.net | September 2000". microcuts.net. Retrieved 17 April 2012. ^ "Muse Gear Guide - Matt Bellamy's FX Pedals". Dolphin Music. 2009-10-01. Retrieved 2014-01-26. ^ "New Muse album 'inspired' by 1984". BBC News. Retrieved 28 September 2014. ^ "Interview with Matthew Bellamy". Youtube.com. Retrieved 2014-01-26. ^ "Behold my trance formation". Genius. Retrieved 2016-03-05.